It has been a long time coming and it looked for a moment that it wouldn’t happen yet again. The Atlanta Falcons finally broke their playoff drought and defeated the Seattle Seahawks by a score of 30-28 to advance to the NFC Championship game against the San Francisco 49ers. It looked early on that the Falcons would run away with the game. Ahead 20-0 at the half and taking a 27-7 lead into the 4th quarter it seemed that they could do little wrong. But the Seahawks, an explosive offense with rookie Quarterback Russell Wilson at the helm stormed back and went ahead with just 31 seconds left on the clock. The Seahawks led by Wilson who set a team record 385 passing yards passed for 2 touchdowns and ran for another. The Atlanta 4th quarter meltdown was of epic proportions. It seemed the the Seahawks who appeared to be on the verge of certain defeat were on their way to the biggest 4th quarter comeback in NFL history. Fox Sports commentator Brian Billick seemed to think so even after the game that they had won stating: “This win legitimizes the Seattle Seahawks as the #1 seed and the team to beat.” It was a great quote and misstatement as Billick obviously meant the Falcons who are the number one seed in the NFC but who was outspoken in his belief that Seattle would win the game. One thing is sure is that Pete Carroll and Seattle will be undefeated next week especially since they will be watching the 49ers and Falcons play. It is hard to lose when you don’t play. Come to think of it it is hard to win as well, but I digress. The only problem was that Seattle hadn’t won. Somehow the Falcons managed to come back. 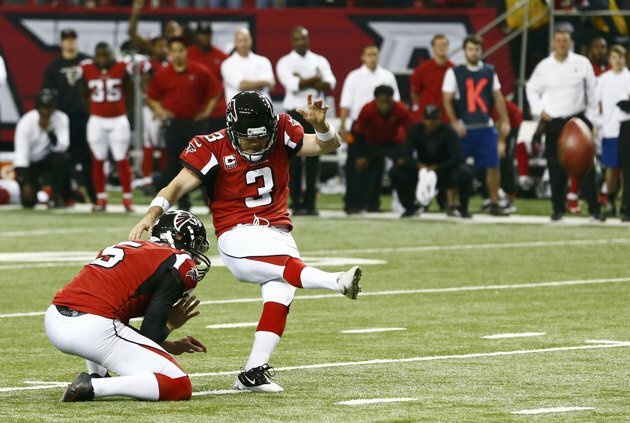 Jacquizz Rodgers returned the kickoff 34 yards and then Matt Ryan struck. Hit hit Harry Douglas for 29 yards and completed a 19 yard pass to Tony Gonzalez. Calling their final timeout the Falcons set up for a 49 yard field goal by Matt Bryant. Just before the snap Seahawks coach Pete Carroll called timeout to freeze Bryant. It was a critical call. Bryant’s kick went wide and would have given the Seahawks the win. However on the second attempt his kick went straight through the uprights to put the Falcons up 30-28 with 8 seconds left in the game. Despite an onside kick by the Falcons that gave the Seahawks great field position Wilson could not rally rally Seattle his last pass, a Hail Mary being intercepted with no time left on the clock. For the Falcons it was a vindication and for their fans a relief. Over the past 5 years they have won more games in the regular season than any time other that the New England Patriots. Until today they had never won a playoff game and Ryan was 0-3 in previous playoff appearances. The Falcons now move on to host the San Francisco 49ers in the NFC Championship game next week. Rats! Wish I’d caught that game, sounds like the 4th quarter was amazing!